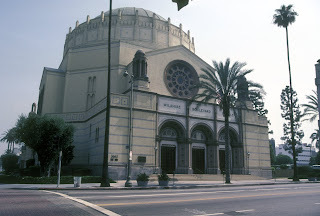 The Wilshire Boulevard Temple (the third home of Congregation B’nai B’rith of Los Angeles), is about to undergo a massive multi-million dollar restoration. The project, which will probably cost more the $30 million is part of an ambitious program of the congregation to renew its historic sanctuary and campus, and to build a new facility that will flourish in the 21st century. In doing this, Wilshire is following a new trend in American synagogues – one that we might call back-to-roots, or at least back-to-the-city. After decades of expanding further and further into the suburbs and exurbs, American Reform and Conservative Jews are coming back in large numbers to urban areas. A t the very least, widely dispersed Jewish communities are finding that the historic locations of many synagogues in downtowns and early suburbs, are conveniently located at points central to the largest numbers of their congregants. Wilshire Boulevard already has expanded into in the exurbs, with two active campuses. The new project, for which the congregation is raising $100 million, will re-establish the site of the 1920s sanctuary as the heart and soul of the congregation. To read more about the restoration plans, see recent stories in The Forward Newspaper, and a lengthy piece in The Los Angeles Times. I have written at length in my book American Synagogues: A Century of Architecture and Jewish Community, about the architecture of the building and its place in the inter-war synagogue building boom that seemed to transform American Judaism, until the trend was overcome and overwhelmed by the Great Depression and World War II. Many large synagogue centers of the 1920s never recovered and were forced to close their doors (at least for Jewish use) by the 1950s. Wilshire Boulevard Temple has managed to survive. Its triumphant and sometimes overwhelming sanctuayr inteiror is intact, though decades of LA pollution have dulled and darkened the once brilliant colors of the murals and rich gilding. The restoration plans follow the successful c. $25 million restoration of the near-contemporary Temple Emanuel in New York, which has been returned that enormous synaoggue to glory. Simple cleaning now makes the richly decorated ceiling visible from belo, and the whole interior The Wilshire work also follows the completion of recent restoration of the Burbank City Hall and the Griffith Obervatory in the LA area, both of which house mural programs by Jewish artist and filmmaker Hugo Ballin (1879-1956), who created the tremendous narrative wall painting program for Wilshire Temple. Ballin was an admired artist who had painted the decorations in the State Capitol building in Madison Wisconsin in 1912, and had moved to Hollywood where he became a prolific and accomplished film artist, designer and silent film director. After the Wilshire Boulevard Temple commission he returned to painting and created the murals in the Griffith Park observatory and the Los Angeles Times Building (1934), and other works. Brenda Levin, the architect overseeing the Wilshire Temple project, is a longtime temple member who also headed the restoration of the Griffith Observatory, the Autry National Center and the Bradbury Building. Wilshire Boulevard Temple was designed by Abram M. Edelman, S. Tilden Norton (honorary president of the Temple), and David C. Allison. Edelman was the son of the congregation’s first rabbi, and had designed the congregation’s previous building. Norton was a member of the congregation, and had built the first and second homes of Temple Sinai. The new Wilshire Temple (completed in 1929) was the dream of Rabbi Edgar Magnin who over a career of several decades, managed to meld a Jewish identity for Los Angeles that joined pioneers and Hollywood moguls. Magnin came to B’nai B’rith as assistant rabbi in 1915 and from that time on he championed a new synagogue building. It was the involvement of the Hollywood movie makers after World War I, the same time Magnin became senior rabbi (1919), that allowed the building to be erected and decorated. Mostly displaced New Yorkers with marginal religious interest, the Hollywood producers were attracted to the media-savvy Magnin’s image of a popular modern Judaism. Even his use of Ballin to create a representaiton narrative of Jewish history - which the Warner Brothers funded - domonstated his savvy. The mural, which encircles the sanctuary, can be seen as either an updated an illustrated history scroll, or as a unwinding "film" of the Jewish past. Rabbi Magnin also foresaw the movement of the city, and especially its Jewish population, westward. In this, the Wilshire Boulevard Temple was both typical and precocious in anticipating the increased suburbanization of the American Jewish life. Because the new synagogue “was beyond the car line” it anticipated the soon near-total Los Angeles dependence on the automobile over the street-car, an urban-suburban transformation that would not affect most Jewish communities until after World War II. It remains to be seen if Rabbi Magin’s CEO-style successor Rabbi Steve Leder is as prescient a planner. If he is, then Los Angeles will have (again) a major and spectacular downtown Jewish center. Lithuania: Pakruojis Wooden Synagogue Continues to Deteriorate. How Much Time is Left? The former synagogue of Pakruojis, Lithuania, was perhaps the most impressive of that country’s surviving wooden synagogues. What remains of the early 19th century building continues to suffer from neglect and vandalism. Dora Boom of the Netherlands recently informed me that wooden planking from one side of the synagogue was being removed (see photos) – presumably to be reused or burned as firewood. Photos by Ruth Ellen Gruber show the damage in 2006. Several projects for the restoration of the synagogue have been floated, but none have been funded. With all the worldwide interest in wooden synagogues, I hope there are donors who might be interested in saving at least this one – probably most important architecturally of those preserved, and one still intact enough to save. But intact for how long? The other wooden synagogues are also in perilous condition. Each Lithuanian winter threatens them with collapse. I thank Dora, Sergey and Ruth for monitoring the condition of this important building, and for supplying photos. Sergey’s virtual reconstruction of the synagogue can be seen by entering the CJA website at http://cja.huji.ac.il/ (be patient). 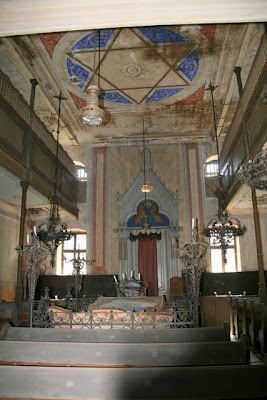 I will be in New York City to speak about Synagogue Architecture in America at the Museum at Eldridge Street (Eldridge Street Synagogue) on Sunday, October 5, 2008. The lectures is part of the NEH-funded series “Academic Angles” created to help the Museum place the story of the Eldridge Street Synagogue and its 20-year restoration into a broader cultural, religious and architectural context. My topic will combine two subjects - synagogue art & architecture and historic preservation. My subtitle is The Choices We Make: The Historic Preservation of American Synagogues. within the confines of a 50-minute lecture, I will describe the major trends of American synagogue architecture from the 18th through the early 20th centuries, comparing those buildings which survive with the historical record of what has been lost. I'll address the issues of how the often selective (and even accidental) nature of historic preservation in America shapes the popular narrative of American Jewish History just as much as history itself determines our decisions about what to save, and how to save it. Many of these ideas have been refined in the past year as part of a project funded in part by a research grant from the James Marston Fitch Charitable Foundation in memory of the late Richard Blinder. I am grateful to the foundation for its support. Regardless of what I will say and how I say it, I encourage you to come if you have not seen the Eldridge Street Synagogue in its restored glory. The lecture will be in the sanctuary. I will also be showing many projected images. Come early to tour the building, which is open all day (Warning: during the lecture a screen will obscure a full view of the opulent Ark wall). For a full schedule of events of the go the Museum website. Jamaica: The United Congregation of Israelites (Synagogue “Shaare Shalom”) Jewish Heritage Center in Kingston expands digitalization program. ISJM has partnered with the Center on the documentation of the 18th century Jewish cemetery at Hunt's Bay, outside of Kingston. The Goldring/Woldenberg Institute of Southern Jewish Life (ISJL) Digital Archive Project is designed to present a history of every congregation and significant Jewish community in the South. Currently, the Project team, led by Dr. Stuart Rockoff, has completed profiles for almost 100 Jewish communities in Alabama, Arkansas, Louisiana, Mississippi, and Tennessee- and will add other states in the future. The archive has posted on-line a detailed, yet succinct history of each community. For most, there is information and photographic documentation of the synagogues and cemeteries. The History Department also houses a major oral history project that seeks to capture the stories of Southern Jews before they disappear. The ISJL Oral History Archive already houses over 500 interviews. The ISJL is committed to making its oral history collection a nationally recognized resource for scholars and students. The Digital Archive is designed to be a continual work-in-progress. If you have additional information about any of the communities or congregations, please contact the archive at: rockoff@isjl.org. The Goldring/Woldenberg Institute of Southern Jewish Life (ISJL) is a private, not-for-profit corporation dedicated to providing educational and rabbinic services to isolated Jewish communities, documenting and preserving the rich history of the Southern Jewish experience, and promoting a Jewish cultural presence throughout a thirteen state region. The Institute began as the Museum of the Southern Jewish Experience in 1986. The Museum, now a subsidiary of the ISJL, helps to define southern Jewish culture through traveling and permanent exhibits, and in recent years, the Institute has dramatically expanded cultural offerings in both small towns and big cities throughout the South. (ISJM) I have received a copy of recently published The Great Synagogue of Budapest by architectural historian Rudolf Klein (Budapest: TERC, ISBN 978 963 9535 82 4). To my knowledge, this is the first monograph about the Dohany Street Synagogue, Europe's largest active synagogue building. Klein presents the Dohany, designed by Ludwig von Forster, as an exciting building in its style and technology, not just as an architectural dinosaur famous for its size and nothing else. His excellent photos support his claims. Much of the book is a social or cultural history of the sophisticated but competitive Jewish world of 19th century Austria-Hungary. The commissioning, planning and presenting of the Dohany Street Synagogue was a grand cultural gesture (much more than a religious one) by Budapest's Jews in their uneasy relationship with Vienna. In this climate, and in the 19th-century world of arhcitecture andd the decorative arts, Klein explores the role and meaning of the Dohany's applied decoration of exotic orientalism. He sees the Dohany as the forerunner to the innovative and offbeat Hungarian architecture of the earler 20th century practitioners of Sezession and Jugundstil design, culminating in the work of Bela Lajta. Anyone interested in 19th century and Hungarian synagogues will want to read this book. Knowing Rudi Klein, and having enjoyed lively discussions with him about the restoration of historic synagogues, I wish he had also included a final chapter or two on the meaning of the Dohany Synagogue in Budapest today for Jews - and non-Jews - and also something about the process - political, economic, practical and aesthetic about the restoration of the great building. The Dohany today is one of Europe's "flagship" synagogues because of it size, elegance, continued use, and because of the attention lavished on its refurbishment. That is a story the remains to be told. The New York-based World Monuments Fund has announced four grants totaling $235,000 to European Jewish preservation projects as part of its Jewish Heritage Grant Program. Funds will be allocated to on-going projects at three historic synagogues and for conservation planning for the former Volozhin Yeshiva Building in Belarus. The projects include the important 17th-century synagogue in Zamosc, Poland that in recent decades served as a municipal library, but is now restituted to the Jewish Community of Warsaw which is overseeing a needed conservation and repair program; the Jugenstil synagogue of Subotica, Serbia, which has been a focus of WMF concern for more than a decade; and the 1903 Choral Synagogue of Vilnius, Lithuania, the only surviving intact synagogue in the city, and now the focal point of it religious life. I'll be posting more about all of these projects in the future. (ISJM) The Jewish Museum of Prague has published a catalog in conjunction with the exhibition of work of Michel Fingesten (1884–1943), which recently closed after several months at the Robert Guttmann Gallery. Fingesten was one of the best known graphic artists in pre-war Berlin, but until this exhibition and catalog, has been almost forgotten. He was born in Northern Moravia, began his art studies in Vienna in 1900, and then left for America where he traveled and made a living by drawing illustrations for newspapers. Fingesten returned to Europe in 1907 and studied with Franz Stuck in Munich. He then went to Asia, where he spent four years. In 1911 he was briefly in Paris, and later settled in Berlin, where achieved success. The Nazi’s labeled his work ‘degenerate art’ in 1933, and Fingesten left the country, moving to Milan, from where he was sent to the Civitella del Tronto internment camp in 1940, and was later interned in Ferramonti di Tarsia. Fingesten died of an infection in Cosenza on the 8th of October 1943, a few days after it was liberated by the British Army. Exhibition curator Arno Pařík wrote the 36 page catalog, which features 100 color illustrations. The catalog, in Czech and English, can be ordered from the Museum website. The Memorial Scrolls Trust has entirely redesigned and reinstalled is facilities at Kent House in London to create a new Czech Scroll Museum, to open to the public with a reception on the evening of September 17th. The previous exhibition has been in place since 1988. I have written about the story of the scrolls before but it is a story that merits retelling. In 1964, 1,564 Torah Scrolls arrived at Kent House in London, the home of London's Westminster Synagogue. After intense negotiations, they were brought from a dilapidated synagogue in Prague where they had moldered since they were collected from the Jewish congregations of Moravia and Bohemia at the time of their destruction. In London, during the next four decades, in a suite of rooms above the synagogue at Kent House, many of the scrolls were restored for synagogue service while others made suitable for use a memorials. Almost all the scrolls have sent out to communities across the world, where their use and exhibition is a constant reminder of the Holocaust. The existence of the Torah scrolls is a constant reminder of the murder of Czech Jews and the destruction of Czech Jewish communities and synagogues in the Holocaust. The survival of the Torah scrolls and their rescue and repair and subsequent distribution to Jewish communities throughout the world, is in its simplest terms, testimony to the resilience of Judaism and the Jewish people. The new museum, which is the product of the energy and commitment of Evelyn Friedlander, Chair and Curator of the Czech Memorial Scrolls Trust, and German designer Fritz Armbruster, tells these stories, and more. The Jewish Museum in Prague has provided support, information and contributed exhibition objects on loan. The new museum shows the various stages of the story of the rescue of the Scrolls, from the tragedy of the Czech Jewish community under the Nazis, to the arrival of the Scrolls in London, the subsequent work done by professional scribes, the sending out of the scrolls to their new Jewish (and non-Jewish homes) and the present-day research undertaken by those recipients to explore the background of their Scroll. Among the exhibits are the remaining scrolls lying on the original wooden racks where they were placed when they arrived, and an display of some of the Torah binders which were tied around the scrolls. The exhibition also show’s the scribe’s table where he worked meticulously upon the scrolls, together with his ink, pens and other equipment. The Museum will open on 17th September and thereafter will be open to the public on Tuesdays and Thursdays from 10 am to 4 pm.? Groups are asked to contact the Trust to arrange party visits. (ISJM) The Foundation for the Preservation of Jewish Heritage reported on September 8, 2008 that the Holocaust monument at the Jewish cemetery in Brzeziny (Lodzkie province) has been vandalized (again). Anti-Semitic graffiti was painted on the memorial tablet. "The Jewish cemetery in Brzeziny, located at current Reymonta St., was established probably in 16th century and was in use until the Nazi devastation during the Holocaust. During communist regime in Poland a sand mine was built on the cemetery grounds. Witnesses report that sand mixed with human bones was used to make prefabricates destined to be used in constructing large condominiums. Many tombstones were stolen and used for construction works, among others, to reinforce the fishing ponds. In 1992, on the initiative of the descendants of the Jews from Brzeziny, the cemetery grounds were fenced." (ISJM) The first national conference of (non-Jewish) Poles who care for Jewish heritage sites in Poland is scheduled for next week (Sept. 15-16) in the town of Zdunska Wola, near Lodz in central Poland. The government-supported conference is the brain-child of local activist Kamila Klauzinska, graduate student in Jewish studies at Krakow's Jagiellonian University, one of many non-Jewish Poles who volunteer to protect and preserve Jewish heritage in Poland. To read more and to see the schedule go to Ruth Ellen Gruber’s Jewish-Heritage-Travel blog. Ruth has been covering many of these efforts as a journalist and travel writer for more than 20 years. This conference is a welcome development and similar events are being encouraged in other countries where Jews are often “caretaker” communities, and cannot provide alone the protection and maintenance that so many of the Jewish sites for which they are responsible require. Only with the help of local people can this be done, and locals are most often willing to help when the better understand the sanctity of sites, and their history and cultural significance. I am pleased to see that Jan Jagielski of the Jewish Historical Institute in Warsaw will be addressing the conference. Long before the fall of Communism, Jan and a small group of colleagues began to document forgotten Jewish sites, and to encourage and train local people in their care. No one knows more about the location and condition of Jewish sites in Poland, especially cemeteries, than Jan. 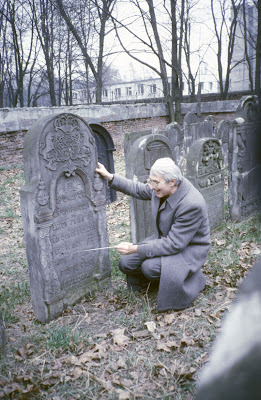 I had the privilege of collaborating with Jan and Eleonora Bergman (now director of the Institute) in the early 1990s as we prepared the first comprehensive inventory of Jewish cemeteries in Poland. That work, which was a project of the Jewish Heritage Council of the World Monuments Fund on behalf of the United States Commission for the Preservation of America’s Heritage Abroad, was in a small way the foundation on which almost all subsequent planning, preservation and legal actions were built. Lena and Jan directed that survey which included sites visits to close 1200 sites over forty participants. Today, Lena, Jan and many of those first survey field workers still lead the way in the care of Poland’s Jewish heritage. Others, like Adam Penkalla of Radom have sadly passed away. Fortunately, however, a new general of younger volunteers and trained professionals has come forward, inspired by the work of the "pioneers." As the documentary and conservation work of the Foundation for the Preservation of Jewish Heritage in Poland demonstrates, much has been accomplished in Poland. Much, of course, remains to be done. We must remember, too, that volunteerism is only one part of what is required to protect and preserve Jewish heritage sites in Poland and elsewhere. There must be government recognition and support of these activites, and they must be fully integrated into broader cultural heritage, education and economic development policies. Lastly, more Jewish communities must be educated and empowered to participate more fully in this role. Sometimes small communities are too overwhelmed with the needs of the present to look back at the remains from the past. Sometimes Jewish leadership is scared (often with good reason) to take on local vested interests of government and business to insist on return of religious and cultural heritage sites. In the 1990s Central and Eastern European governments had incentives - EU and NATO membership among them - to cooperate in this effort. Now, with other global problems looming, it is difficult to gain (often new) governments' interest and commitment. ISJM applauds the efforts of the volunteers of Poland and encourages others to learn from their example. Conferences: First Congress of Jewish Art in Poland: Jewish Artists and Central-Eastern Europe, 19TH Century to WWII (Kazimierz on the Vistula River (Poland), 27-29 October 2008). This is a mega-conference with dozens of speakers from Poland and around the world. I will be there, speaking about the influence of Polish synagogue architecture on American synagogues in the the 19th and 20th centuries. (ISJM) Sixty years after the end of the war, looting and restitution of Jewish cultural artifacts remains a topic of intense interest and relevance. The Jewish Museum Berlin will open an exhibition later the month that addresses numerous open questions and unsolved cases. The exhibition Looting and Restitution. Jewish-Owned Cultural Artifacts from 1933 to the Present narrates the historical events, context, and consequences of the looting carried out by the Nazis throughout Europe. According to the Museum, "the exhibition tracks what happened to individual cultural artifacts confiscated by the Nazis - from paintings and libraries through porcelain to silverware and private photos - and the fates of their rightful Jewish owners. Alongside well-known names such as the Rothschild family or the art dealer Jacques Goudstikker, long-forgotten collections such as Sigmund Nauheim's Judaica collection and the pianist Wanda Landowska's collection of historical musical instruments will also be shown. The exhibition also looks at those who profited from and played an active role in the looting. It highlights Nazi organizations such as "Sonderauftrag Linz" and "Einsatzstab Reichsleiter Rosenberg" and the disreputable role played by museums, libraries, and art dealers. Not least, the exhibition looks at the shortfalls and inadequacies of the politics of restitution following the war, and the claims that were not settled at the time which shape the current debate." (ISJM) Ruth Ellen Gruber has reported on her blog the destruction of the building that formerly housed the synagogue of Travnik, Bosnia. Reports are that a shopping center will be built on the site. 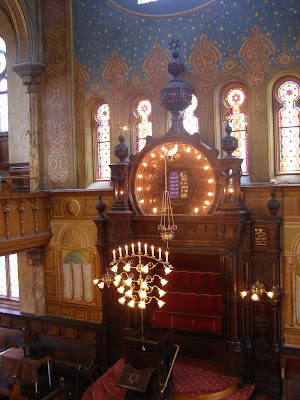 Built in 1860, the synagogue has been used as a metal workshop since after World War II. No recognizable signs of its earlier use as a synagogue were visible, The building had not served Jewish use since 1941, and there was no obvious indication of its original function. Neither the local government nor the Jewish Community of Bosnia has a use for the building. A Photograph shows the 1860 synagogue. According to Ruth Gruber, calls were made to halt the demolition. A citizens' group called "Front" asked Bosnian authorities to step in. A brief report by Bosnia's FENA news agency quotes a member of the Sarajevo Jewish community, Eli Tauber, as saying that the Community can do nothing to stop the process as the building had been sold off after World War II. "A Jewish community has existed in Travnik, Muslim Croat Federation of Bosnia-Herzegovina, since 1768, and the first synagogue was built in 1769. During the period of the Ottoman Empire, Travnik was the seat of the Pasha, making Travnik the most important city in the Ottoman province of Bosnia and its Jewish community the second in importance, after Sarajevo. The number of Jews increased constantly, and reached a peak in 1940 of 375 Jews. After WWII only a few Jewish families resettled in Travnik and the recent war delivered the final deathblow to the Jewish community. I was not able to enter the [surviving] synagogue, built in 1860 on the foundations of the previous synagogue and therefore the building is only partially documented. The communal chronicles say that the synagogue was built entirely by voluntary work of members of the community between Pesach and Rosh Hashana. Travnik is in a way strange City when Jews are in question: during the WW II Jews were killed, synagogue was damaged (but not destroyed) and all ritual objects were taken by the local Croatian and Moslem Nazi-collaborators to the nearby Jesuit monastery. After the war only a handful of survivors returned, and since the synagogue was not suitable for prayers Jesuits returned everything to the Jewish community in Sarajevo. In the spring of 1941, local fascists partially burned and looted the building, took the ritual objects (Torah scrolls, silver items from synagogue, books, tefillim, tallitot) from the synagogue and gave them to the local Jesuits. After the war, the Jesuits returned the Torah and ritual objects to the Jewish community in Sarajevo which in turn donated part of the collection to the Jewish museum in Belgrade. The synagogue was stripped of everything that would indicate its former use. The hall has been divided horizontally on the level of the former women's gallery, whose entrance was from the outside. Behind the synagogue is a building which housed a Jewish school and the Rabbi's apartment. So, truth is that the building has been sold by the Federation in early '50, (there were good reasons for that and I can elaborate on that), used for some time as a kind of metal workshop and was abandoned before the last war so the Jewish Community had no legal rights on the building but the truth is also that Municipality of Travnik and local City Museum asked more than once if Jews are interested to find together with them some solution for the survival of the only Jewish prayer-house in the city for any kind of cultural use. In the City Museum are four recently discovered silver artifacts, thought to be from the house of one of the oldest Jewish families of Travnik. Researchers documented two silver Esther Scroll cases, a silver book cover belonging to the family of Yaacov Yeruham Konforti, and a silver belt. The cache was found while digging the foundations of a new house in 1989. It was presumably hidden and buried at the site of Konforti's house. One of the Esther Scrolls is engraved with Konforti's name and the date 5650 (1890). There is also an engraved floral decoration and a hallmark indicating that this was made by the same artisan who made the prayer book cover. The Jewish cemetery in Travnik, founded in 1762, is outside of the town on the slope of one of the surrounding hills, bordering the Catholic cemetery. It is large, quite overgrown with vegetation, but in decent condition. In the center of the plot is a monument to those who perished in WWII. It is a concrete pedestal on which are positioned three tombstones, possibly among the oldest ones from the cemetery." (ISJM) The almost century-old synagogue in Gherla (built 1911? ), Romania is empty and at great risk. 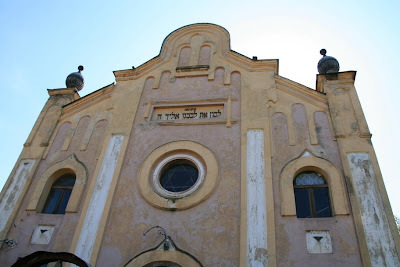 Discussions have begun, however, between descendants of Jews from Gherla, local authorities, and the Federation of Jewish Communities of Romania (FedRom) to preserve the synagogue, possibly as a town library. As there is only one Jew left in Gherla, some new use needs to found for the building if it is to escape eventual collapse or demolition. The nearest active Jewish community is in Dej. Gherla itself is an interesting place. It appears to be the first city in Romania built based on an orthogonal grid-plan when Gherla was rebuilt by Armenians allowed to settle there in the 17th century. Jews were given rights to settle in the early part of the 19th century. By the early 20th century when the present building was erected, Jews represented about 12-15% of the city population. The street where the synagogue is located is part of a historical heritage district, but according to Mr. Klein the synagogue itself has not been designated a historic site. (ISJM) One of the major retrospective exhibitions of an American and Jewish artist this year has gone virtually unnoticed in the US press. But in Italy, where the major exhibition of sculptor Ibram Lassaw’s work has been dramatically mounted in the Sassi (caves & cliffs) of the southern Italian town of Matera, Lassaw’s work has received extensive coverage, with over 80 newspapers articles heralding his work. "The Great Exhibition in the Sassi" 2008 opened June 14, 2008 and will be on view until October 18 2008. The exhibition features approximately 80 sculptures and 50 drawings made from 1929 to 1996, loaned from the Ibram Lassaw Foundation in East Hampton, NY and from private American collections and museums including the Whitney Museum of American Art; Heckscher Museum of Art - Huntington; Guild Hall Museum - East Hampton; New Jersey State Museum - Trenton; Neuberger Museum- Purchase and from the Peggy Guggenheim Museum in Venice. The exhibition is co-curators Giuseppe Appella and Ellen Russotto, illustrate in depth Lassaw's artistic life. Lassaw was born in Alexandria, Egypt, in 1913. He moved to New York in 1921 and died in East Hampton in 2003. He began to make abstract sculpture in the 1930s, and over the new two decades he strove to create a formal balance between geometric and organic form. He was one of the most important American artists of the "New York School". 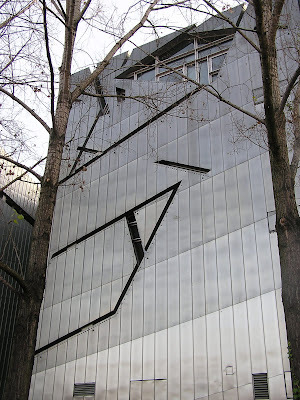 His can also currently be seen in the exhibition Action / Abstraction at the Jewish Museum in New York. Lassaw also created synagogue art for Temple Beth El in Springfield, Massachusetts designed by Percival Goodman. There his menorah and eternal light were much less assertive. They were essentially wire sculptures made of welded metal rods, similar to some of the pieces on view in Matera. They are transparent and appear to float in a sanctuary that is warmer and more engaging than the Congegration Kneses Tifereth Israel. I asked Lassaw’s daughter Denise how her father’s work came to be in Matera, and why now? She told me that Lassaw was in a group exhibition Sculptura in America installed in Matera in 1990 by the Museo della Scultura Contemporanea Matera (MUSMA), which opened that same year in the Sassi, the extensive cliffs of cave dwelling (natural and man made) in which residents of Matera have lived for millennia. The museum is in two places in the Sassi: a dedicated museum that is part cave and part building; and lower down the gorge, a series of interconnected Sassi, old churches with frescoes and Neolithic storage pits; that all open to the gorge and the river below, amid the tangle of small bushes and trees, goats with bells. The Lassaw exhibition is in both places. For those who do not know Matera, its unique mix of landscape and architecture create one of the most unworldly and evocative environments in Europe. Though in antiquity and the Early Middle Ages there were hundreds of Jewish communities scattered across Southern Italy (remains can be seen not far form Matera in Venosa and Trani), there are no Jewish monuments known in Matera . But because to many, the landscape evokes ancient Judea, the Sassi have been a backdrop for many Biblical films ranging from Pasolini’s Gospel According to Saint Matthew (1964) to Bruce Beresford’s visually stunning King David starring Richard Gere (1985). In the post-World War II period “optimistic modernism” the Sassi were deemed unhealthy slums, and beginning in the 1950s the Italian government began a program of forced relocation of Sassi residents. The museum is part of more recent program and to reclaim and preserve the Sassi, and today, they are a major part of the tourist and artisan economy of the region. Professor Lee Shai Weissbach of the University of Louisville (Kentucky) will speak on September 21, 2008 about small town Jewish communities in a lecture at the Spertus Institute in Chicago. Dr. Weissbach is author of Jewish Life in Small Town America (Yale University Press, 2005). He also wrote the excellent (but poorly titled) The Synagogues of Kentucky (University Press of Kentucky, 1995). I say "poorly titled"since the book is about so much more - it presents the history of American synagogue architecture in the context of community building - illustrated with a detailed cataloging of the synagogues in one relatively small state. It's one of my favorite "unknown" books to pass on to others. His more recent book addresses some of the same issues, but from a national perspective. It is a required antidote for those whose ideas about American Jewish history have been shaped by reading only Irving Howe's The World of Our Fathers. Weissbach writes that by the 1920s, at there were around 500 small U.S. cities and towns with Jewish populations of 100 to 1,000, and that the history of these communities is an important component of the American Jewish experience. These communities were not miniature versions of big city Jewish life. They offered an alternative version and vision of Jewish America in part drawn from small town Jewish life in Central Europe, and in part based on American traditions of individuality, entrepreneurship and social responsibility. Tickets are $20 | $15 for Spertus members | $10 for students Call 312.322.1773. The lecture is at 2 pm. There will be a book signing following Dr. Weissbach's lecture. 22 to 25 November in Amsterdam, the Netherlands. The Association of European Jewish Museums (AEJM) has announced its 2008 Annual Conference to be held 22-25 November in Amsterdam, the Netherlands. The conference, which is the first and best opportunity for European Jewish museum professionals to gather to discuss issues and projects of mutual concern, is open to members of AEJM and invited guests. This year's conference is hosted by the Jewish Historical Museum in Amsterdam, which will present its completed program of expansion and redesign, including the restoration of the former Ashkenazi Great Synagogue and the re-installation of the exhibition within its space. Collection Management issues: Database / Digitization. Object identification: case-study Mediene (provincial Jewry) Project. To learn more about the AEJM and AEJM membership go to their website. AEJM welcomes representatives of Jewish Museums and Judaica collections from throughout Europe. Representatives from other museums and related institutions are also welcome to participate on a limited basis. To find out more about the conference program and eligibility to attend and participate, contact Sara Tas at sara@jhm.nl. This coming Sunday, September 7, is the 9th edition of the European Day of Jewish Culture. This year the theme is Music, "inviting the public to discover the place of song and music in Judaism, as well as the cultural diversity characteristic of Jewish music, or the Jewish contribution to the world of music." In the United Kingdom the event is called "European Days of Jewish Culture and Heritage", because events and activities are scheduled over a period of three weeks. As I wrote in an earlier posting: "The day is a celebration of Jewish heritage sites and culture across Europe and is now observed in 30 countries. Developed following a program in Alsace that arranged for dozens of usually inaccessible synagogues, former synagogues and cemeteries to be open to the public, the Day of Jewish Culture now includes almost every conceivable type of cultural event including lectures, concerts, tours, and seminars. But access to Jewish sties for a wide (and mostly local public) and instruction about them remains at the heart of the celebration." Belgium, Czech-Republic, France, Germany, Hungary, Italy, Lithuania, Netherlands, Norway, Poland, Portugal, Slovakia, Slovenia, Spain, Sweden, Switzerland, Turkey, Ukraine, United Kingdom.